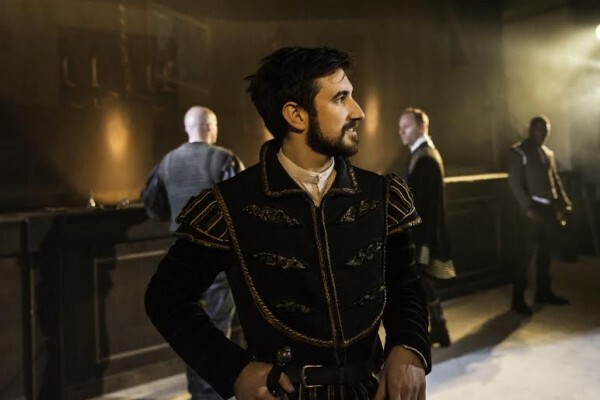 In the latest in our series on theatre design, Alice Saville talks to Helen Scarlett O’Neill about the making of Venice Preserv’d and the staging of La Serenissima in Deptford for The Spectators Guild. A peddle-powered Popemobile, three gondolas gliding through Deptford’s muddied waters, a carnival parade that follows the route of the old Greenwich Fair, commedia performances, and audiences in bin-bag ruffs and paper plate headgear; Helen Scarlett O’Neill’s design for Thomas Otway’s tragedy Venice Preserv’d plans to collide 17th century Venice with a slightly less, or otherly, storied floating city. That is, the half-reluctantly regenerating docklands of South East London, and specifically, the unpoetically named Paynes & Borthwick Wharf. What’s being built is a “time-clash” between 17th century Venice, 17th century London, and the present day, introduced by a freshly-commissioned prologue by Owen McCafferty. “It works fantastically well; it’s about comparing on one side Canary Wharf, and on the other side Venice, old and new, what’s similar, what’s different.” It’s a pairing echoed by the “beautiful flashy big world of the carnival, then underneath the rotting Venice, which we’ve created using scaffolding and builder’s plastic.” Material wealth is a central theme of Thomas Otway’s play, first staged in 1682, which used Venice as a watery veil for poignant references to Restoration London’s political and social state. As Helen Scarlett O’Neill explains, “the play is about when the rug is pulled from beneath you and your debts are called in – the carnival of life collapsing in on you.” Poignantly, the play’s Senate scenes are played against a mesh backdrop, through which the lights of the City’s rather more technologically advanced moneylenders across the river will be seen as night falls. And to heighten the links still further, the audience change their pounds for (specially forged) ducats with a moneylender character, lodged inside a Venetian carnival style maquette of the Canary Wharf. Deptford’s indebted population of arts students from nearby Goldsmiths College and Trinity Laban and well-established local community are increasingly being joined by wealthier migrants, attracted by shiny waterfront developments and even a new Waitrose. Venice Preserv’d is stepping into the heart of these tensions around gentrification. O’Neill explains that “we’re next door to the Master Shipwright’s House (a lovingly restored local landmark dating to 1708) and one evening they shouted out “where are you?” and we said “Venice!” But then they said “Do you think you’re in Greenwich?” And it feels like this building is on the divide. They’re building a bridge over the creek, and the waterfront is going to change dramatically.” For now, the inhabitants of the Wharf are at peace with their surroundings. The junior sailors at the AHOY centre nearby “are some of the best people I’ve ever met. They’re young carpenters who are making the prows and sterns for our boats, and other bits of our set including a torture wheel for the finale.” They even took to sea in costume for the show’s Youtube trailer. Getting theatre-goers to raid their wardrobes and kitchen cupboards in an artistic kind of self-mockery is all part of O’Neill’s interest in “how you can make the audience tell the story to the audience, so they’re part of the set and part of the action.” After graduating from St Martin’s BA Theatre Design course, she explains that “one of my first experiences was working on the area design for Punchdrunk’s Faust. It made me think, ‘what if you take away the masks, what if you show bits of architecture that were covered up or weren’t used?’ It was a fantastic production, but it also solidified my thoughts, and made me want to try and explore different things.” These have included Unfashion shows, in collaboration of Japanese fashion designer Kumiko Tani and Russian director Pavel Rudanovsky, and, in a more direct antecedent to Venice Preserv’d, a promenade performance of Hamlet on the opposite bank of the Thames, directed by Yuko Iwata. Venice Preserv’d runs at Paynes and Borthwick Wharf, Deptford, until 8th June 2014. For more on Helen Scarlett O’Neill’s work, visit her website. Alice Saville in conversation with Joanna Scotcher. Catherine Love in conversation with Tom Scutt. Dan Hutton in conversation with Chloe Lamford. Dan Hutton in conversation with Es Devlin.